Pumps were used to drain out canals along Sukhumvit Road while engineers collected rubbish, dug up the mud and cut overgrown grass. 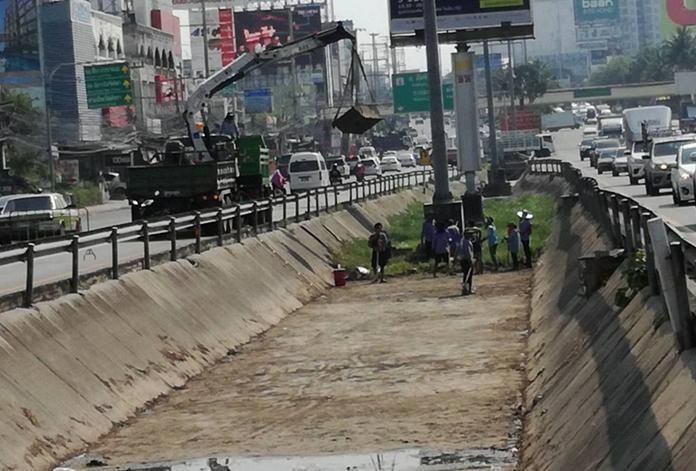 Sanitation workers scraped out a Sukhumvit Road drainage canal, which had been blocked by hyacinth and garbage. Workers used shovels and heavy equipment to dig up mud and rubbish to restore water flow in the crucial storm-drainage waterway Feb. 13. The work continued throughout the afternoon with workers making it to the intersection of Central Road before calling it a day. City officials said that they will be working on more public areas, clearing out drains and canals around Pattaya. They will be also cutting the overgrown grass along the roads as well so that the flooding issues will have minimal effect on the residents in the future.